Right click on the selected image and choose "Create Virtual Copy". Set the copy's exposure to "-2". Right click on the virtual copy and again choose "Create Virtual Copy". Set this copy's exposure to "+2". Select all three images in the film strip. Right click the selction and choose "Export -> HDR Efex Pro". Once HDR Efex Pro has loaded, locate the "EV Spacing" drop down option and select "2". Click the "Create HDR" button. Now use the adjustment options to make the image look how you like. 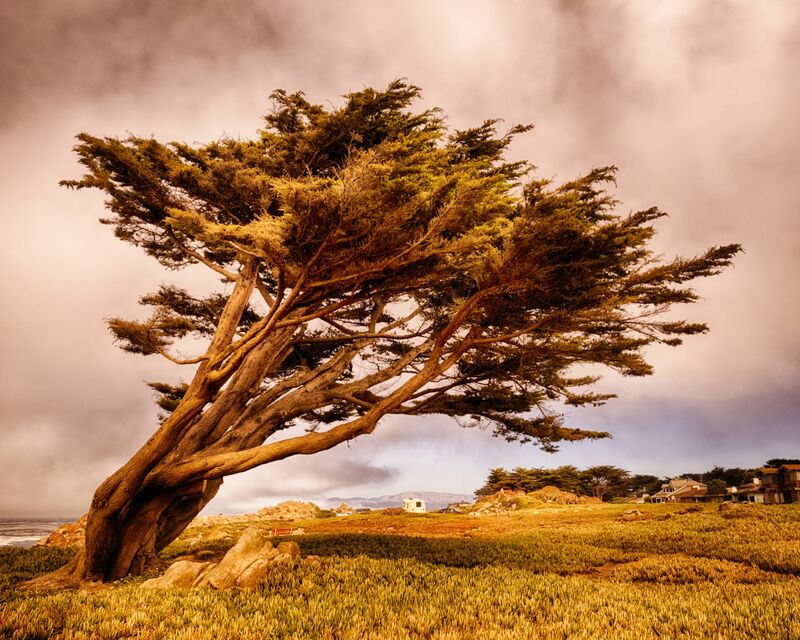 A single shot HDR of my favourite tree in Pacific Grove. I shot to preserve the highlights in the sky, then used the SSHDR technique to pull out the color and details of the scene. The only picture I took was the "0" picture. The other two are virtual copies with modified exposure values. Flat blue skies will cause difficult to correct halo effects. They don't look pretty and it can be extremely tedious to get rid of them after the fact. Easier to correct but more annoying (to me at least) is that sensor dirt will be accentuated. If there is even a single spot on your sensor that isn't immaculate, SSHDR processing will find it and make it so painfully obvious, your legally blind aunt will be asking why you don't clean your gear more often.